E' molto carino, la frase sopra mi piace un sacco! è molto bella questa candela! reading your blog ! Such great inspiration ! I am a new blogger and would love for you to check out my blog and follow back if you like it ! ..io vado matta per le candele profumate! Natale a casa mia ad esempio, odor di cannella ovunque!!! I love scented candles and the quote is so so right! 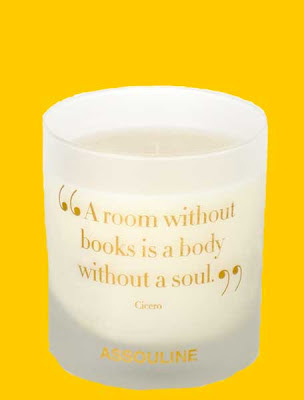 Well I couldn't agree more with that candle!! Buon weekend cara! un bacio! Bellissima candela siccome anchio adoro i libri! Love this! I took a candle to my office with a "warmer" so I can still smell it but don't have to light it (no open flames at work). Maybe you could try this? Adoro le candele e questa è così carina! thank you for your comment on our blog ♥! were following you on Gfc , will you follow us back ;] ? Thanks for your comment on my blog!. You have a great blog and great pics too. ..I love candles but only when the scent is soft. Btw, I'm following ya already, do you mind following back? Books + candles + bathub + small glass of wine = AHHHHHHH!!!! Grazie cara, anche a te!!! I love your blog so I'm your newest follower! books are very vital to life i feel!! As a grad student in English, this is totally appropriate for me. Hi! Thanks for coming on my blog! I'm following you on GFC and Bloglovin' now, it'd be nice if you did the same so we could keep in touch!